Between the Europa Clipper and the proposed Europa Lander, NASA has made it clear that it intends to send a mission to this icy moon of Jupiter in the coming decade. Ever since the Voyager 1 and 2 probes conducted their historic flybys of the moon in 1973 and 1974 – which offered the first indications of a warm-water ocean in the moon’s interior – scientists have been eager to peak beneath the surface and see what is there. Towards this end, NASA has issued a grant to a team of researchers from Arizona State University to build and test a specially-designed seismometer that the lander would use to listen to Europa’s interior. Known as the Seismometer for Exploring the Subsurface of Europa (SESE), this device will help scientists determine if the interior of Europa is conducive to life. According to the profile for the Europa Lander, this microphone would be mounted to the robotic probe. Once it reached the surface of the moon, the seismometer would begin collecting information on Europa’s subsurface environment. This would include data on its natural tides and movements within the shell, which would determine the icy surface’s thickness. It would also determine if the surface has pockets of water – i.e. subsurface lakes – and see how often water rises to the surface. For some time, scientists have suspected that Europa’s “chaos terrain” would be the ideal place to search for evidence of life. These features, which are basically a jumbled mess of ridges, cracks, and plains, are believed to be spots where the subsurface ocean is interacting with the icy crust. As such, any evidence of organic molecules or biological organisms would be easiest to find there. 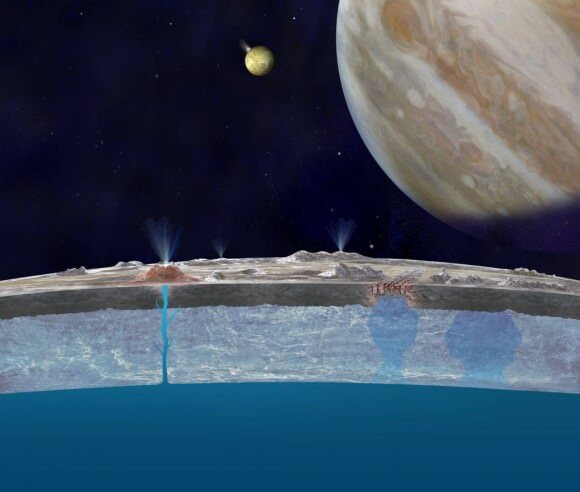 In addition, astronomers have also detected water plumes coming from Europa’s surface. These are also considered to be one of the best bets for finding evidence of life in the interior. But before they can be explored directly, determining where reservoirs of water reside beneath the ice and if they are connected to the interior ocean is paramount. While the idea of a Europa Lander is still in the concept-development stage, NASA is working to develop all the necessary components for such a mission. As such, they have provided the ASU team with a grant to develop and test their miniature seismometer, which measures no more than 10 cm (4 inches) on a side and could easily be fitted aboard a robotic lander. Europa’s “Great Lake.” Scientists speculate many more exist throughout the shallow regions of the moon’s icy shell. Credit: Britney Schmidt/Dead Pixel FX/Univ. of Texas at Austin. More importantly, their seismometer differs from conventional designs in that it does not rely on a mass-and-spring sensor. Such a design would be ill-suited for a mission to another body in our Solar System since it needs to be positioned upright, which requires that it be carefully planted and not disturbed. What’s more, the sensor needs to be placed within a complete vacuum to ensure accurate measurements. The SESE can also take a beating without compromising its sensor readings, which was tested when the team struck it with a sledgehammer and found that it still worked afterwards. According to seismologist Edward Garnero, who is also a member of the SESE team, this will come in handy. Landers typically have six to eight legs, he claims, which could be mated with seismometers to turn them into scientific instruments. Having this many sensors on the lander would give scientists the ability to combine data, allowing them to overcome the issue of variable seismic vibrations recorded by each. As such, ensuring that they are rugged is a must. Such a device could also prove crucial to missions other “ocean worlds” within the Solar System, which include Ceres, Ganymede, Callisto, Enceladus, Titan and others. On these bodies as well, it is believed that life could very well exist in warm-water oceans that lie beneath the surface. As such, a compact, rugged seismometer that is capable of working in extreme-temperature environments would be ideal for studying their interiors. What’s more, missions of this kind would be able to reveal where the ice sheets on these bodies are thinnest, and hence where the interior oceans are most accessible. Once that’s done, NASA and other space agencies will know exactly where to send in the probe (or possibly the robotic submarine). Though we might have to wait a few decades on that one!